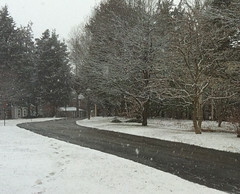 It's Snowing at Long Hill, a photo by randubnick on Flickr. We finally got some snow today. It started snowing around 2 PM, with more in the forecast. Here in Massachusetts, a prediction of snow means a flurry of errands before the storm: get gas, stop at the store, go to the bank. And in the midst of a series of such errands this afternoon, we took a break to walk the dog at Long Hill Gardens, here in Beverly. The snow was already falling, and it didn't seem like a very practical thing to do. But our little dog is a schipperke, and she loves the snow! And of course, our dog has the right idea! It was fun to be out while the snow was falling, and I took a lot of pictures. In this one, I was trying to catch the snow coming down. 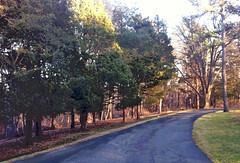 This is a view of the road that leads to the main building, formerly a private mansion but now owned by the Trustees of the Reservation. Tonight I used iPhoto to crop this image out of one of the best photos. (I also used the retouch tool to transform a small car into a bush.) I am glad I took time to play in the snow today. 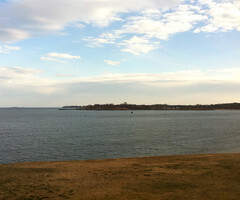 Looking North From Independence Park (Beverly, MA), a photo by randubnick on Flickr. This is another photo that I took yesterday during a walk at Beverly's Independence Park. Things look different in winter light, even if there is no snow. I used my iPhone camera. 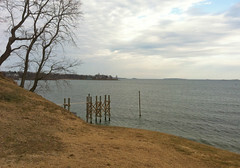 This view is looking north toward Lynch Park (land mass in the distance). You can also see some islands on the horizon. Tonight I used iPhoto to straighten the image and to crop it to get this composition. February at Independence Park, a photo by randubnick on Flickr. It was overcast today, but it looked colder than it really was. Although the wind was chilly, the air temperature was in the forties, so we went for a walk at Independence Park, a beach-front park here in Beverly, Massachusetts. I thought the sky was beautiful, and I liked the low light of winter, so I took some pictures. Despite a hectic day, I did a quick little edit in iPhoto and here is the result. Basic Mountains (Digital Oil Pastel), a photo by randubnick on Flickr. I was short on time tonight, but decided to keep going with my exploration of Painter 12. 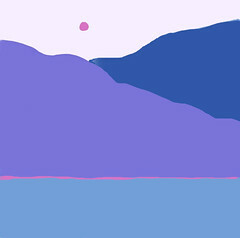 I did this very quick little digital drawing of basic mountains using digital oil pastel. (I grew up in Colorado and mountains are always in my mind's eye.) My biggest problem was finding and using the grid controls. But I am happy with how the drawing came out and glad that I stole a few minutes to do it. Spring Daydream (Digital Oil Pastel), a photo by randubnick on Flickr. Tonight, even though it was late, I decided to start a new image in Painter 12. I am still getting used to the new controls and layout in the upgrade. I can read the instructions (and I am), but for me, the best way to learn is to just force the issue and make some art. Tonight I chose digital oil pastel, something I don't usually use. 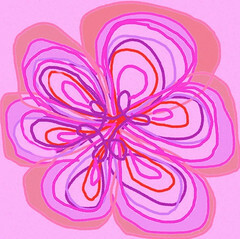 I kept the drawing simple, just some flower shapes out of my imagination, not much more than a doodle. But I had a good time and am feeling a little more comfortable with Painter 12. Winter Reflections (Digital Woodcut), a photo by randubnick on Flickr. I used Painter 12 to create this image by applying the "woodcut" effect to my recent photo of the pond at Bradley Palmer State Park (in Topsfield, Massachusetts) . I played with the controls to get the amount of black and that I wanted, which was just enough to emphasize the lines and textures in the image. It has been a long time since I have experienced a winter with so little snow; the colors I am seeing remind me of the colors of winter in southern Colorado, where I grew up. Winter Reflections (Posterized Photo), a photo by randubnick on Flickr. Yesterday I posted a photo that I took at Bradley Palmer State Park, a view of the pond in February of a dry winter. Last night I used Painter (new upgrade to 12) to create this posterized version of the image. I also created a "digital woodcut" of the photo, which I plan to post here tomorrow. Winter Reflections, a photo by randubnick on Flickr. This is a photo that I took at Bradley Palmer State Park last week. (We had stopped for a walk with the dog after a trip to the vet.) 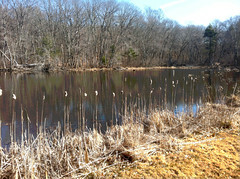 In the summer, this pond is full of water lilies and bordered by cattails. And most winters, this is a landscape in snow and ice. But in this dry winter, this is a landscape in rich golds and browns. You can still see the stalks of the cattail plants bordering the pond. Tonight I used Painter to adjust the shadows and to obscure a sign with a little digital pastel. I also used Painter to create a posterized version of this photo, as well as and a digital woodcut. To be continued. Chicken Collage Day 17 (Feb. 21, 2012), a photo by randubnick on Flickr. I went to the studio this morning and took a little time to work on this project, an image of a chicken made up of patterns. This crazy idea came to me while I was looking at chickens last summer during a walk at Long Hill Garden. I was amazed by the patterns in their feathers. I instantly had a mental image of what I wanted to do, and couldn't shake the idea. So here I am, months later, still working on this chicken. Today, I spent time on the tail feathers. This part is very time-consuming because it is like doing a jigsaw puzzle. I also added some white triangles to the back and neck of the bird. I have no overall plan for this; I am making it up as I go along. Even though the process is tedious, I am not complaining because working on this chicken always makes me smile. Field in February, a photo by randubnick on Flickr. If you have been watching a little too much Downton Abbey, as I have, you might imagine that this is a photo of the English countryside. But in fact, this image began with a photo that I took today during a late afternoon walk at Beverly Golf and Tennis, a local public golf course. 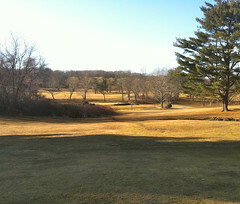 Here, north of Boston, it is unusual to see a field in February that is not covered in snow, so we usually miss the warm golden tones of dry fields in low winter light. Tonight I edited this in iPhoto, adjusting shadows and saturation, and then cropping the image to get this composition. Happy Pattern in Blue (Digital "Print"), a photo by randubnick on Flickr. I have been exploring my new update to Painter 12, and did a little more today. 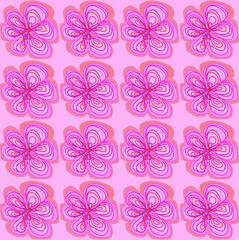 I tried out the pattern pen, using the "Happy to Draw" pattern that I made yesterday. The controls are a little different and are in different places, but I am happy because the pattern pen in Painter 11 stopped working a few months ago. I made a couple of images with the pattern pen for practice to get the hang of it. I started to relax and have fun, and that's when I made this image. 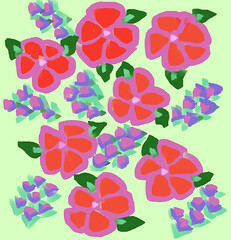 I used a blue canvas and the pattern pen was loaded with digital pastel in fuschia. I also did a little posterizing to get this image, and a little bit of cropping in iPhoto as well. Happy to Draw (Digital Pattern), a photo by randubnick on Flickr. Yesterday I posted a little digital drawing that I made using my brand new Painter 12 upgrade. I wanted to draw something quick and simple just to try out the basic functions. Today I continued my exploration by creating a pattern from that little drawing. Over the past several months, some of the functions in Painter 11 became problematic and even stopped working, no doubt due to compatibility issues with upgrades to my Mac OS. Making patterns was one of those functions. At first, I was unable to find old patterns I had created. But I am used to that because it seems to happen with every upgrade. But then the "capture pattern" function stopped working completely, so I couldn't make new ones. Making patterns is fun and also very useful, so that really convinced me to stop procrastinating already and upgrade to Painter 12. Now I am happy that I did. Just to make sure everything was going to work, I also uploaded this image into Zazzle. That also worked smoothly, and I am already using this little pattern on some new items. Happy to Draw (Digital Drawing), a photo by randubnick on Flickr. This week I (finally) upgraded to Painter 12. Today I finally got the program installed and operational, and this is my first drawing with the upgrade. Painter is an amazing program that I have been using since sometime in the 1990s, despite the fact that I am a (recovering) technophobe. Each upgrade in Painter is a bit of a learning curve; the main tools and functions stay the same, but may be in a different place on the screen. You have to keep upgrading because Painter changes as Mac and Windows operating systems change. But I love Painter so much that I don't mind, well at least not much. Painter 12 comes with a beautiful little guidebook, which I plan to read. But I was happy and I had to draw right away. As soon as Painter was working, I started a little doodle that turned into a little sketch. I only had about 15 minutes to work on it, but I just wanted to see if I could do something pretty basic. Tonight I kept going with it a bit more, trying to use the "magic wand," "color overlay," and "posterizing" tools. So far, so good. Rhododendron Flower Buds, a photo by randubnick on Flickr. Birds Skating on the Pond (Posterized), a photo by randubnick on Flickr. 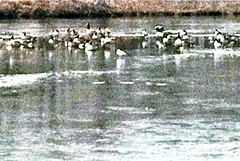 This is a digitally edited version of the image I posted yesterday, geese and seagulls apparently skating on the Cummings Center Pond. Tonight I used Painter 11 to adjust the lighting and focus, and then posterized it. Then I transferred the image into iPhoto and readjusted the color. I am not sure which version is better, at this point. Birds Skating on the Pond, a photo by randubnick on Flickr. 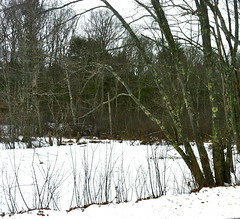 This afternoon, we stopped at the Cummings Center Pond for a walk. It was partially frozen over, and there were lots of geese as well as some seagulls who seemed to be walking around on the ice. I tried to take some pictures, but I had nearly no battery left in my iPhone. I tried anyway, zooming in to get the best shot I could. Tonight I cropped and edited this image in iPhoto to get this image. There is more to do; I plan to edit this in Painter and see what I can do with it. But I am currently between versions, switching from Painter 11 to Painter 12 (hoorah)! So I plan to come back to this in a couple of days. Irish Landscape (Revised and Posterized), a photo by randubnick on Flickr. 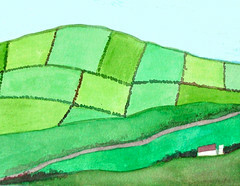 This is a small watercolor of an Irish hillside that I painted in Belfast after a road trip to the Irish Republic several years ago. I posted the original version here back on August 5, 2007. Today I came across it while I was looking for images of Ireland. I wanted to use it for greeting cards and gifts for next month, so I knew I would need to revise it a bit because it was small and low resolution. I opened the original in Painter and changed the size and resolution. Then I posterized it a bit, which looked good on everything but the sky. So I used some digital pastel to smooth out the problems and posterized again. It looked better. Then I cropped the image to this format, which seems easier to use. Later, I did upload this version into Zazzle, and it worked pretty well. So it was worth the time. And it is always a pleasure to remember my trips to the Emerald Isle. 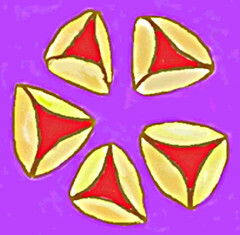 Happy Hamentashen (Posterized), a photo by randubnick on Flickr. Chicken Collage Day 16 (February 11, 2012), a photo by randubnick on Flickr. Yesterday I decided to take my drawing materials back to the studio. 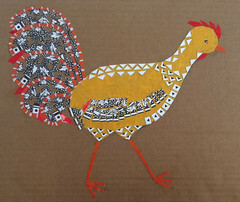 While I was there, I decided to work for a while on this project, a collage of a chicken made up of patterns. I added the white triangles to the bird's back, added a piece of red paper to mark the end of the wing, and added a few pieces of black and white polka-dots to the tail feathers. 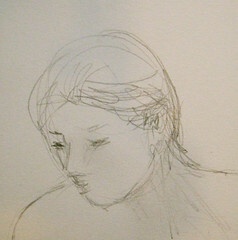 Five-Minute Sketch (Detail) from Feb. 8 Drawing Session, a photo by randubnick on Flickr. This detail is cropped from a five-minute sketch that I did Wednesday night at a figure drawing group at Porter Mill Studios. I used a Sharpie but didn't realize it was blue till I started to draw. 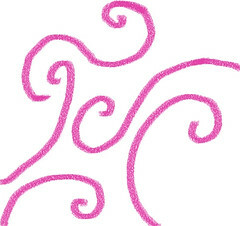 In the interests of full disclosure, when I saw this image on my computer screen, I noticed a couple of very distracting "loop de loops" that I made with the pen. Although I wanted to maintain the spontaneity of the line, I decided to clean up these distractions by using a little cut-and-paste in Painter. Snow Scene at Bradley Palmer, a photo by randubnick on Flickr. No, it hasn't snowed here. 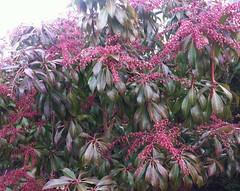 (It is supposed to snow on Saturday; maybe it will look like this. ) This is a photo that I took at Bradley Palmer State Park back on January 23. I have been editing it in iPhoto, and tonight I decided to post it. I was interested in the textures of the grass against the snow, and the subtle colors of the lichens or mosses on the tree trunks. Time for a Tree (Final) a video by randubnick on Flickr. Time for a Tree, a photo by randubnick on Flickr. It's the New Year of the Trees (Tu B'Shevat), one of my favorite Jewish holidays. I loved the idea as a kid, and I still do! Last year at this time, I made a sketch of a tree in four seasons on my iPad with the Brushes app, and because Brushes captures a stroke-by-stroke video as you draw, the result was an animation. Today I decided to do another one, so I got out my trusty iPad. I plan to post the video tomorrow showing this tree going through time, but for now, here is the final image, the last frame in the stroke-by-stroke video. View from Pope's Landing (Posterized Photo), a photo by randubnick on Flickr. 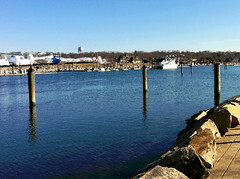 Here is where my birthday celebrations began today, having coffee and chocolate eclairs at the water's edge and then taking a walk with my daughter and our dog at Pope's Landing in Danvers. We have been wanting to do this for a long time, and finally we did today. I like having little adventures on my birthday, and this was the first of many treats and surprises that happened today. The water was a briliiant blue in the original photo, but tonight I did some selective posterizing to enhance the colors. 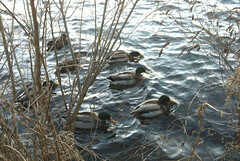 Ducks (Digitally Edited and Posterized), a photo by randubnick on Flickr. This image started with a photo that I took last Monday at the Cummings Center Pond. We had stopped there to walk the dog late in the afternoon. I was surprised to see these ducks right at the edge of the pond, so I got out my camera. I had to photograph them through the grass. There was a lot of grass, more than you see here! For the past few days, I have been working on this image in Painter, carefully obscuring some of the blades of grass with digital pastel, so that more can be seen of the ducks. In some cases, I could only remove a little bit of grass, because without having to start inventing visual information. (I did color matching with the closest color.) I did this little by little, and it seem to work. 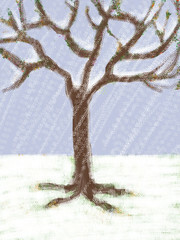 Then I used Painter to posterize the image, and then cropped it to get this composition. I am happier with the image, and although this little project was time-consuming, it was good practice. Rumba (Digital Pastel Sketch), a photo by randubnick on Flickr. I came home late from a ballroom studio dance, happy but tired. 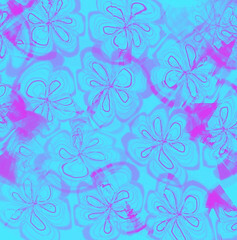 I sat down at the computer, opened Painter, and was trying to work on editing a photo, but decided it was too complicated for tonight and I am too tired to do it justice. So I put it aside for now and instead opened a new file. I decided to do a drawing that reflected what I was thinking about, which was dancing. So I used some digital pastel to draw this little sketch using curves inspired by the twirling moves of the rhumba. And here it is. Road at Long Hill (Posterized and Digitally Modified Photo), a photo by randubnick on Flickr. This image began with a photo that I took a few days ago, during a late afternoon walk at Long Hill Gardens here in Beverly, MA. I liked the golden light and the curve of the road. I took a picture even though I knew I would probably need to do something about the road, which is asphalt (known as 'hot top' here in Boston). Obviously many, many efforts have been made to fill cracks in this road with tar, so there are little trails of black line all over the road. Because I like the composition well enough to use for a painting sometime, I decided to see if I could do some digital road repair myself! I opened the image in Painter and used some digital airbrush on the road, just enough to make the black lines less distracting. Then I did some posterizing with the selection tool so I could control how much posterizing effect to use with each area. Once I got the image back into iPhoto, I used the slider to warm up the "temperature" a little bit, to emphasize the golden glow of the four o'clock light. 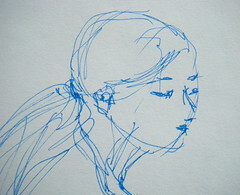 Detail, Drawing from Drawing Group Session on Feb. 1, 2012, a photo by randubnick on Flickr. Last night I went to a new figure drawing group organized by one of the artists at Porter Mill Studios. When I lived in Lawrence, Kansas, I was part of a drawing group that met every week. It was great practice and we even had group shows. Since then, I have taken several classes in drawing and painting the figure, but it has been a couple of years. So I was pretty rusty, and pretty nervous at first, especially with quick (5 minute poses). But as the poses went to 10 and then 20 minutes, I began to relax and things got somewhat better. Nonetheless I remained frustrated with what I was creating. But when I looked at the drawings today, I was actually happy with a few of them. This is a detail (head and shoulders) of one of the best ones, done with pencil on heavy paper. 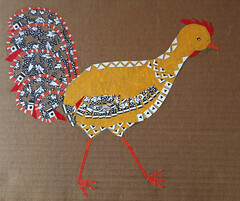 Chicken Collage Day 15 (February 1, 2012), a photo by randubnick on Flickr. Today I had a chance to get to the studio and work on this collage for a while. I am making a chicken made up of patterns, an idea that suddenly popped into my head while I was watching some beautiful chickens and admiring their plumage. I like the face on this chicken, and don't want to do too much to it. But I have been trying to figure out what to do with the neck and back. Early this morning, I looked on the internet for photos of different chicken breeds to get some ideas, and saw that some chickens have a kind of ruff around the neck. So I decided to try that, as you can see. I think this approach will work. I also filled in some more of the tail feathers with black and white polka dot pattern.